Both the volume and complexity of medical imaging have grown significantly. Practitioners are challenged by test result overload including results containing incidental findings. These incidental findings, while noncritical, are nonetheless actionable. Numerous studies show these incidental, yet actionable findings are not well communicated and tracked. This failure to track in a timely manner can lead to delayed diagnosis and treatment, poor patient outcomes, and legal liability. Failure to adequately communicate results is the third largest cause of litigation against radiologists. Best practice test result management requires that all actionable findings are both communicated effectively and then tracked contemporaneously to 'close the loop'. 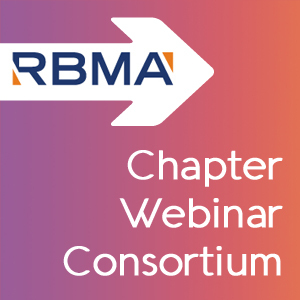 The Chapter Webinar Consortium consists of eleven RBMA Official Chapters who have joined together with RBMA National to provide bi-monthly webinars to their members. The participating chapters are: California, Delta States (Alabama, Louisiana, Mississippi), Florida, Heartland (Kansas, Missouri), Illinois, New England (Maine, Massachusetts, New Hampshire, Vermont), Northeast (Connecticut, Delaware, New Jersey, New York, Pennsylvania), Ohio, Oregon, Rocky Mountain (Idaho, Montana, Utah, Wyoming) and Texas. RBMA Members within these Chapters register for FREE. RBMA Members not located in these Chapters can register for a nominal fee ($25). Non-members may also register for an increased fee ($100).